With the Atlantic Ocean as a backdrop, an Atlas V launch vehicle, 19 stories tall, with a two-ton Mars Reconnaissance Orbiter (MRO) on top, roars away from Launch Complex 41 at Cape Canaveral Air Force Station at 7:43 a.m. EDT. 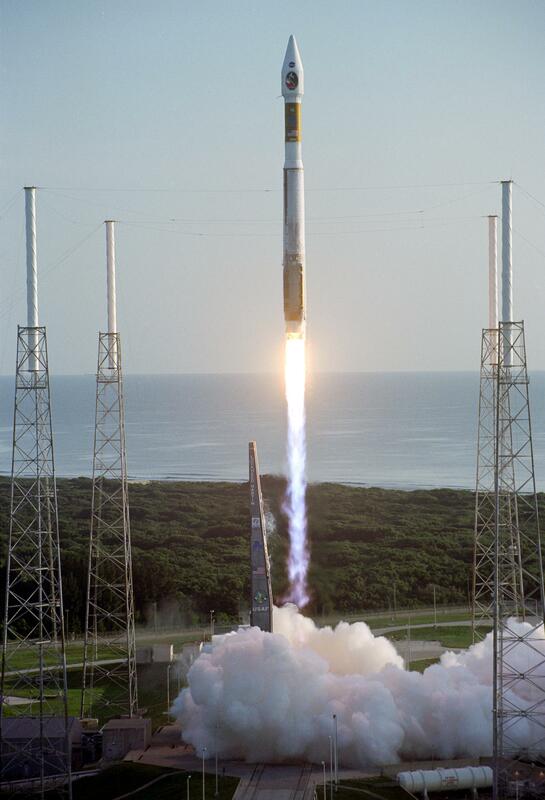 All systems performed nominally for NASA's first launch of an Atlas V on an interplanetary mission. MRO established radio contact with controllers 61 minutes after launch and within four minutes of separation from the upper stage. Initial contact came through an antenna at the Japan Aerospace Exploration Agency's Uchinoura Space Center in southern Japan. Mars is 72 million miles from Earth today, but the spacecraft will travel more than four times that distance on its outbound-arc trajectory to intercept the red planet on March 10, 2006. The orbiter carries six scientific instruments for examining the surface, atmosphere and subsurface of Mars in unprecedented detail from low orbit. NASA expects to get several times more data about Mars from MRO than from all previous Martian missions combined. Researchers will use the instruments to learn more about the history and distribution of Mars' water. That information will improve understanding of planetary climate change and will help guide the quest to answer whether Mars ever supported life. The orbiter will also evaluate potential landing sites for future missions.